Remember revolutionary arcade games such as house of the dead? The difficulty was outrageous, and the cost was ridiculous. There were literally crowds surrounding it watching two kids that blew around fifty bucks beating it. Zombie Crisis 3D by KONGZHONG CORPORATION plays just like the house of the dead. 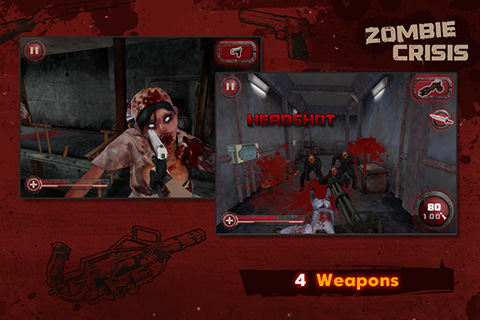 You start out with a single pistol in hand on a mission to cure the world of the zombie infestation. I had to jump on the gun to review the Zombie Crisis 3D game on the iPhone because I for one have been a long time zombie game and zombie movie fan. I can honestly say I was one of those kids that probably blew around fifty bucks trying to beat House of the Dead. Not only did playing this app for my iPod touch feel refreshing but as the same time, it brought back the nostalgia I missed so much. Unlike all the other iPod touch apps that feel like twenty rounds of mini games, Zombie Crisis 3D brings back the feeling of actually playing an arcade game. Zombie Crisis 3D runs very smooth and the point to shoot is quite accurate. There are three difficulty settings which give the game great replay value. Although the graphics aren’t the best thing I’ve ever seen, that is easily forgivable because they are the best I’ve seen for the iPod touch. There are also three different types of guns you can pick up along with health items and ammunition that you can shoot to pick up. A free version is sitting in the app store for you to try if you’re still not sure about buying this app. Unfortunately the free version isn’t that long and you can finish it faster than downloading it. Now for the bad news. The game only has 5 levels with about 4 maps per world. Not really a long game, but it certainly has some good replay value due to the difficulty settings. There are also boss fights that follow the same type of style that House of the dead did so well. There were two bugs that I came across while playing Zombie Crisis 3D. The first was a serious problem because it basically muted the sound effects. I was only able to fix this issue later on by syncing the game to my iTunes, deleting it from my iPod touch, and re-syncing it back in. The last bug I found was just a minor crash that only occurred once. The $2.99 price value of Zombie Crisis is well worthed because the game feels more like an old school arcade or console game. If you’re a fan of arcade shooters like Time Crisis or House of the Dead, Zombie Crisis 3D is definitely a game to check out. 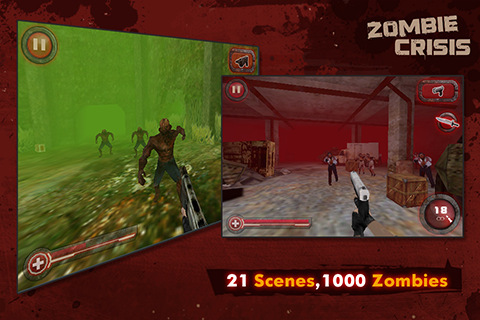 Sample the free version of Zombie Crisis 3D on your iPhone. AppSafari review of Zombie Crisis 3D was written by Vincent Tam on February 9th, 2011 and categorized under Action, App Store, Arcade, First Person Shooter, Games. Page viewed 4100 times, 1 so far today. Need help on using these apps? Please read the Help Page.